Tamatert Guesthouse is a friendly property located in the small town of Imlil, in the foothills of the High Atlas Mountains. Tamatert Guesthouse is a coloured house in perfect harmony with the environment. The property is only surrounded by nature. Guests can relax on the rooftop terrace or in the traditional living room. We provide a friendly and personalized service to make your time in Imlil a truly memorable experience. Whether your stay is just overnight, for a week or longer, we hope to make you feel as our clients describe it: a home far away from home to which you will want to return. 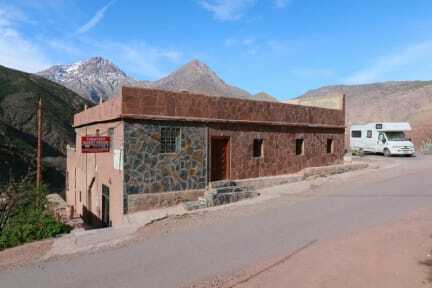 Tamatert Guesthouse is located in the small town of Imlil in the High Atlas Mountains. The guest house is 60 km from Marrakech city. Perfect location for those who to discover the richness of the area. The property is located in a very quiet area on a beautiful hill overlooking Imlil. Tamatert Guesthouse offers a wide range of private and shared accommodation. Each room features local decoration and includes a private bathroom. Check-in time starts at 11 am. Payment types accepted at this property: cash. Taxes not included - Local occupancy tax 2.00 euros per person per night. I had a wonderful couple days in Tamatert. The family were very welcoming and showed me good hiking routes. Food was very good. The wifi was superfast and had lovely hot showers. Just to note I was the only vistor during my stay so I can’t compare it to when it’s full. It’s a good base just outside of Imlil and is a 30 min walk from the grand taxi drop off point. If you are hiking Toubkal you can start from the hostel and hike around Imlil to the first checkpoint, you also can leave your bag. Our host made us feel so welcome, and created a very pleasant atmosphere. He surprised us with free tea and pastries two times, and gave us great advice on where to go hiking. The beds were very comfortable, the shower was warm, and the terrace has an incredible view looking down on the town! You will not regret staying here! Our stay here was perfect for our plans to climb Mount Toubkal, we stayed one night, did the 2day hike, were able to leave our bags in storage there, before returning to stay another night on the 2nd day.facilities were clean, our room was very nice and the view from the balcony=AMAZING! Hassan who owns the guesthouse with his lovely family were so helpful and looked after us so well, went above and beyond- thankyou for wonderful hospitality! 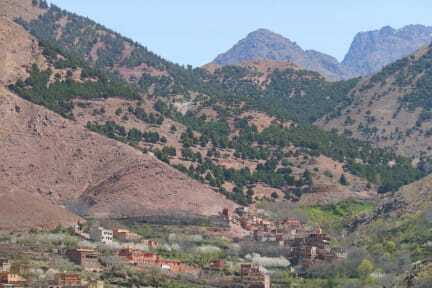 I stayed one night at Tamatert guesthouse to hike Toubkal. I could leave my luggage at this place and I hiked with things I needed only. The owner gave me even a lunch package for the hike. The guesthouse is a little bit out of Imlil but still in walking distance. As a reward you get a super nice view over the valley and Imlil from the balcony. Dinner was delicious and more than I could eat. Everything was clean and Hassan is a nice guy. In total highly recommendable!